The DL On DP: No Performance Anxiety Here! After basking in the afterglow of monumental success at the box office February 2016, and earning the title of Highest Grossing R-Rated Film (behind The Passion of the Christ), Ryan Reynolds squeezed back into the red spandex to reprise his role as Wade Wilson/Deadpool for the highly anticipated sequel which stormed into theaters May 18th. Deadpool 2 debuted with a whopping $125,507,153 opening weekend, which comparatively was just shy of matching it's previous record by about $10MM (in which the original raked in $132,434,639). However, the sequel did clinch the number two spot for All-Time Top Opening Weekend Record By A Rated Film, behind it's previous film, Deadpool, sitting comfortably as king numero uno. It's safe to say the latest installment survived the dreaded case of what has been dubbed 'sequelitis', and continues to reap the benefits even with a packed box office including Marvel's heavy-weight Avengers: Infinity War, and Disney's Solo: A Star Wars Story. Alongside the Merc with a Mouth stand-out characters from the first film also reprised their roles, including Wade's girlfriend Vanessa (played by Morena Baccarin), taxi driver turned getaway car go-to Dopinder (Karan Soni), and Negasonic Teenage Warhead (Brianna Hildebrand). Additionally, Stefan Kapicic returned to voice the X-Men's metal mentor, Colossus, but we all saw that coming... except Blind Al... who also returned! Deadpool 2 also opened its arms to new talent, adding to their ranks the likes of Josh Brolin who took on the role as a time-travelling cyborg, Cable, Zazzie Beats (from the hit show Atlanta) as 'lady luck' Domino, and rising star Julian Dennison as Firefist. 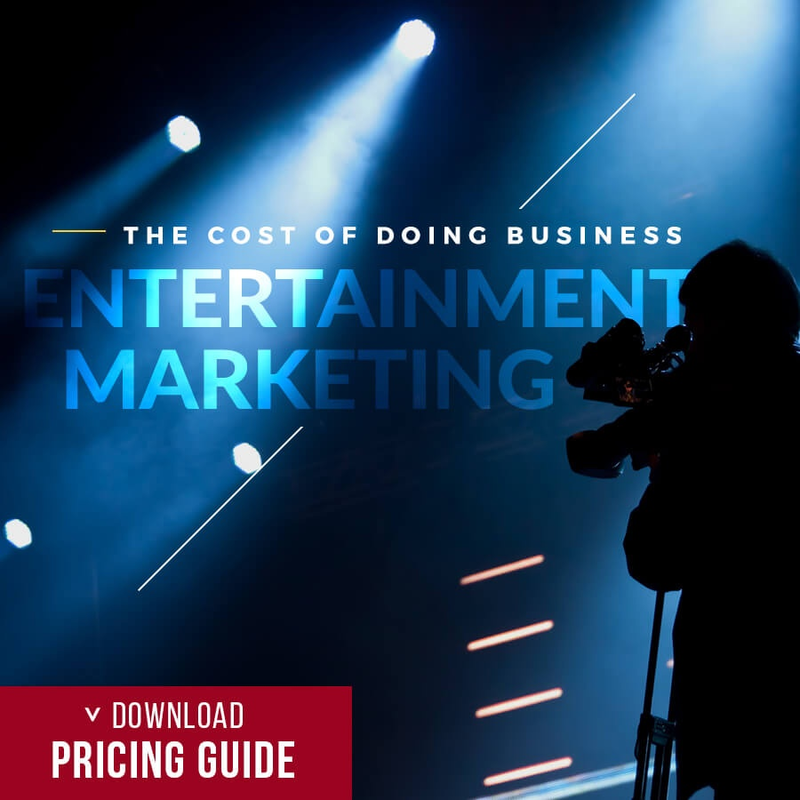 With a significantly larger budget (make that almost double from $58MM to $110MM), larger ensemble, and larger worldwide dominance, the creative minds on the film's marketing team went back to work and brought us some of the best campaigns and collaborations to date. And no, we're not just talking about the epic music video team-up with Céline Dion (yes, that happened, we aren't kidding), but we would be remiss not to mention it. Rather, there were specific brand partnerships, some new to the Deadpool world and some returning players, who caught our eyes and social feeds leading up to the film's release. But who were these brands you might ask? You've come to the right place. Grab a chimichanga, settle in, and let's count them down. P.S. Told you we weren't kidding. Coming off a successful partnership with the first Deadpool, Mike's Hard Lemonade packed an even bigger punch for the sequel, with a multi-faceted campaign including product placement in the film, exclusive in-theater content, co-branded digital ads, and an all-new experience for fans in the form of a Sister Margaret's Pop-Up Experience in Los Angeles and New York City (a HARDER adaptation of Wade Wilson's favorite bar: Sister Margaret's School for Wayward Girls, as featured in Deadpool and Deadpool 2). Fans age 21+ had the chance to hangout at the one and only Sister Margaret's School for Wayward Girls, as featured in the film, for the HARDER adaptation of Sister Margaret's Pop-up Experiences in both New York City and Los Angeles. Along with the Pop-Up Experience, Mike's HARDER also rolled out limited edition flavors and branded cans, reminiscent of their previous campaign with the first film (not that we're complaining). The initial announcement hit the internet a month ahead of Deadpool 2's release, with the caption: "The most seamless integration in cinematic history. Please drink responsibly." To celebrate the partnership (and to salute the sequel's impending release) 12 HARDER flavor cans flaunted Deadpool 2 limited-edition collectible packaging and cheeky slogans including, "Any HARDER and it wouldn't be liquid," "Nice cans," and "Not your grandma's sauce." From an exclusive online interview with PRNewswire, Senior VP of Marketing for Mike's Hard Lemonade, Sanjiv Gajiwala, gave more insight into the partnership by explaining, "Deadpool and HARDER make a perfect duo - they are both bold, provocative, and unapologetically take risks. This partnership hits the spot just right... Just like HARDER, Deadpool doesn't just live a little, he lives a lot. If he sees a chance, he takes two. He doesn't wait for one door to open, he kicks them all down." In the same interview Zachary Eller, Executive Vice President of Marketing Partnerships with 20th Century Fox, went on to say, "We loved working with Mike's HARDER on the first movie and are excited to see this epic relationship continue to grow. The Mike's HARDER team has really had fun crafting this campaign!" 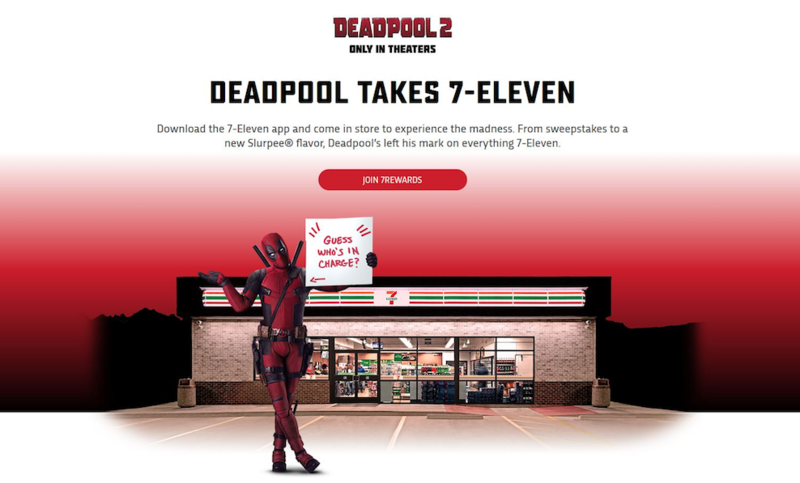 Continuing the theme of memorable campaigns, 7-Eleven got in on the action with what they called the 'Deadpool Takes 7-Eleven' which kicked off May 7th. 20th Century Fox and the prominent convenience store shook hands on a deal that featured themed products, sweepstakes promotions, and an augmented reality (AR) in-store experience that brought Deadpool directly into the store via the 7-Eleven app, with new activities released weekly. In the press release published by the corporation the impact and reasoning behind the large-scale nationwide takeover (which also included our neighbors to the north) was further explained. “We are bringing an unprecedented level of excitement to 7‑Eleven this summer. Our customers love Deadpool, and our collaboration includes exclusive products and an amazing in-store augmented reality experience that is among the first of its kind at any retailer,” said Sean Thompson, 7‑Eleven Senior Vice President and Chief Customer Officer. 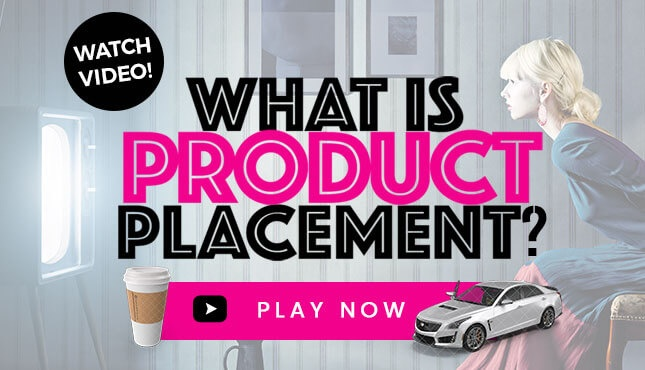 To encourage app-download initiative, fans could earn 7Rewards loyalty program points at the checkout, and enter a contest for a chance to win prizes such as movie tickets, Deadpool 2 merchandise, and trips to Vancouver, New York, Los Angeles, and Las Vegas. 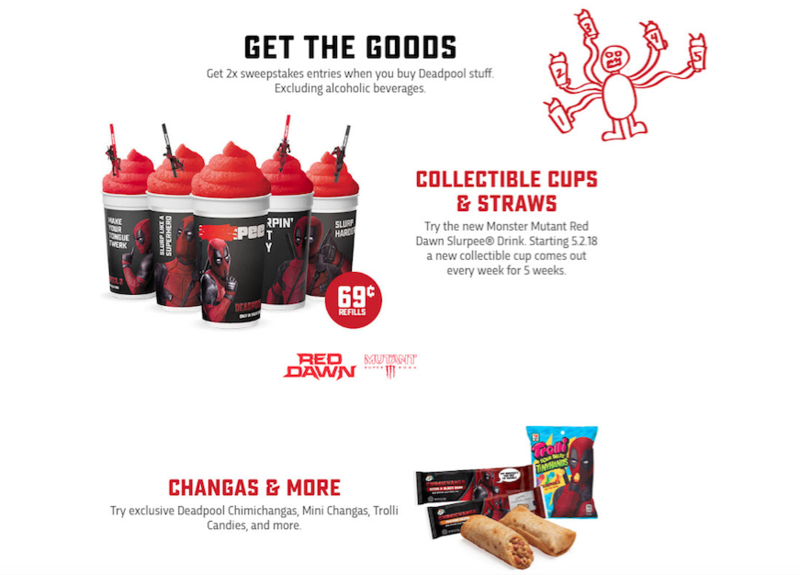 As part of the in-store specials there were a number of product mashups including a new Slurpee flavor, collectible cups (for the low, low price of 69 cents because... of course), Deadpool-themed straws, chimichangas, limited edition Monster Mutant energy drinks, and movie-branded Trolli gummies. In sum, 7-Eleven makes for the perfect stop from the theater to satisfy any lingering cravings, and quench fans Deadpool thirst. With Ryan Reynold's recently becoming the owner of Aviation Gin, it seems odd that his character (or should we say alter ego?) would sign a partnership deal with a tequila company. But with the Deadpool franchise nothing is too odd or absurd it seems, and nothing is untouchable. 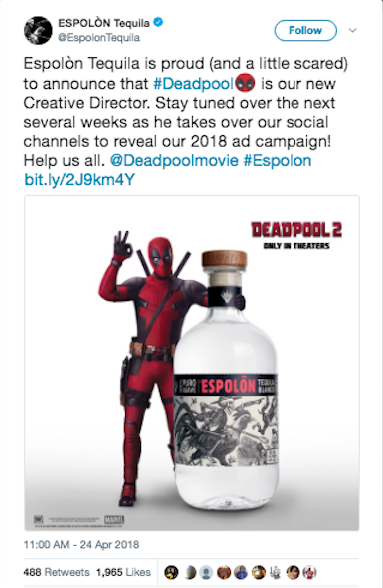 Espolòn Tequila, best known for their unique tequila branding of Dia de Los Muertos (Day of the Dead) art on its label, teamed up with the leather-clad mercenary after he initially expressed “interest” in working with them. Effective soon after, Deadpool assumed the self-imposed title of “Creative Director for Culture ‘n Stuff”, and pumped out as brilliant a campaign as you'd expect. Which is nothing short of impressive for his first time. 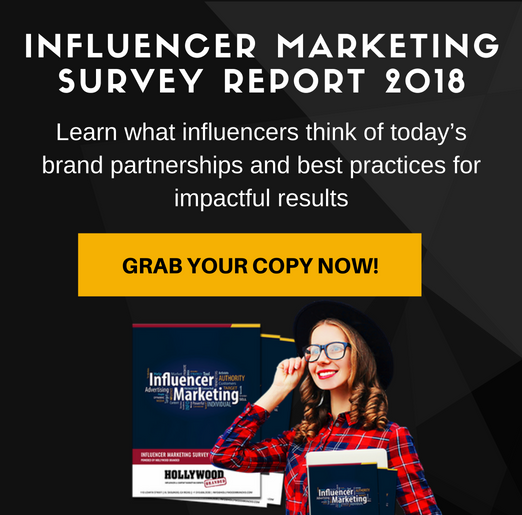 In addition to the announcement, the campaign included custom packaging, in-store displays, out-of-home, and a social media takeover in which Deadpool claimed custody of the company's Twitter account, increasing the partnership's buzz... with no notable hangovers! Last on our list, but certainly not least, 20th Century Fox partnered with DEVOUR, one of the made for microwave behemoths as far as instant satisfaction, and a tantalizing meal, is concerned. The exclusive frozen food aisle brand turned up the heat by introducing its all new line of sandwiches with juicy meats, gooey cheeses, and toasted golden-brown bread, not to mention several pasta options as well. A feast fit for any fancy Deadpool fans were certain to eat up. 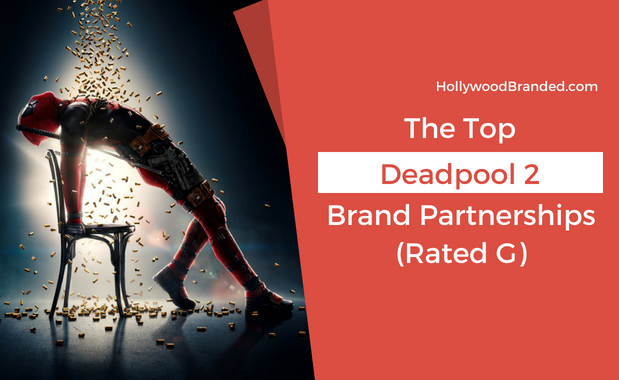 The partnership included custom packaging, POS and outdoor in select markets, as well as a new digital spot, where Deadpool took viewers inside his dreams, riding a unicorn through a supermarket in search of a satisfying sandwich for a midnight craving (or a case of the munchies, it's hard to tell). Can't Get Enough? Neither Can We! 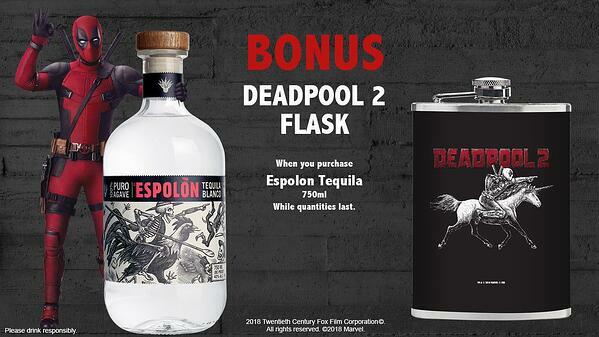 When it comes to originality Deadpool's marketing strategies and wacky freedom definitely take the cake. In fact, these are just a few of the fantastic campaigns the franchise has produced, and with talks of an X-Force movie on the horizon, and a possible (read as: probable) third installment, there is certainly more to come. 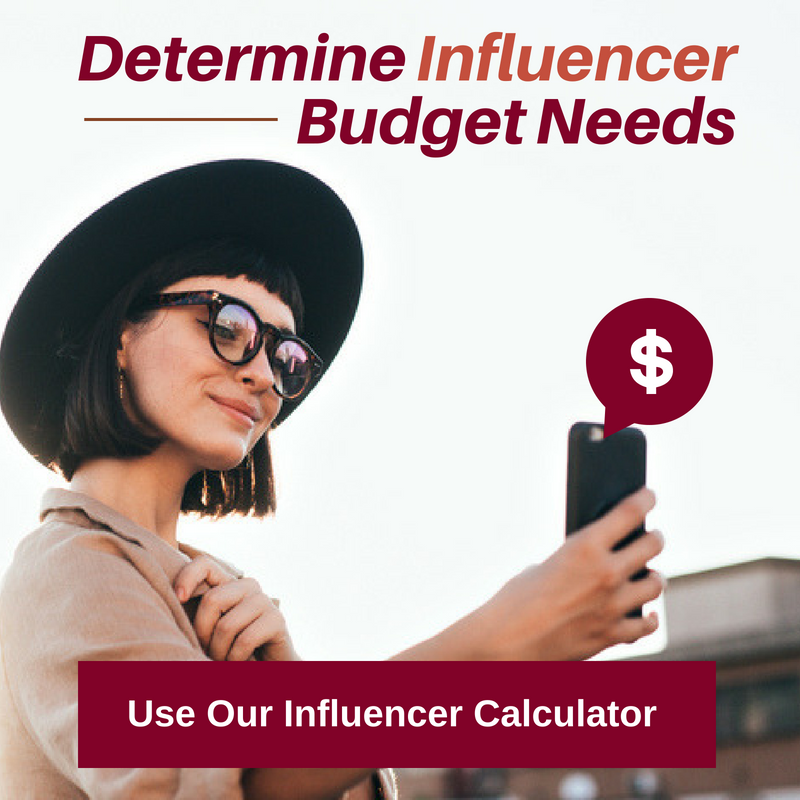 To read more about Deadpool and Deadpool 2 integrations, partnerships, marketing tactics, and to gain further insight on how brands leveraged the meta-humored Merc check out our other blogs! You have to at least WANT to start thinking about product placement and promotions after all of those fantastic partnerships, right?!? 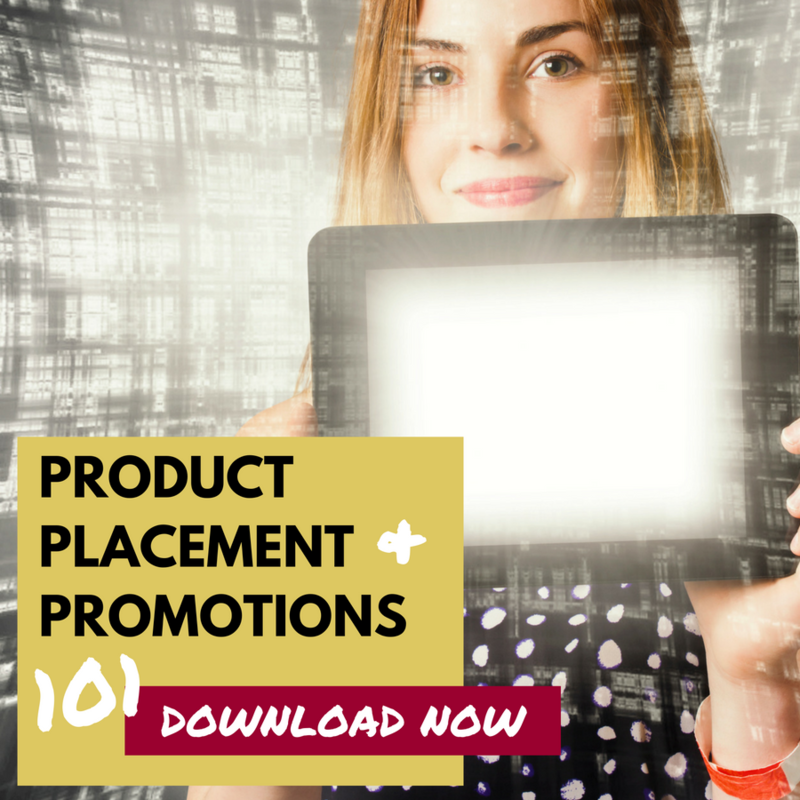 Then check out our Product Placement & Promotions 101 eBook which walks you through how everything works!